Apologies for the lack of posts in the last few weeks. Reason is because I bought a new kayak! 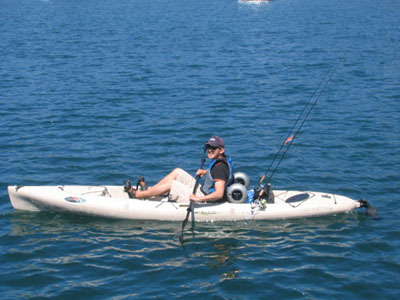 It is a Hobie Revolution and is built with fishing in mind. It set me back about $2500, more than enough for a 2nd hand tinny, but has its advantages of taking it around yourself without the need for a trailer and boat license, rego etc. Have not caught anything from it as of yet, only taken it out for a spin twice, but looking forward to posting some catches in the near future. Here’s a pic of me on at Yowie Bay in Port Hacking. The main features are: the peddling system called the Mirage Drive, which works exactly like how a penguin swims. This is an added advantage for the fishos as it frees up the hands for the fishing rods and you can chase a big one if it takes off while still holding on to the rod. There are also some Hobie Trax wheels, which come with the package that fit in the scupper holes behind the seat so that the kayak can be easily transported. The kayak goes very fast at full speed, especially with the peddle system and is easy to control with the rudder system. Still trying to get the hang of it, how to load and unload it off the car, and where to launch etc. I will post more intricate details in the near future.